The Intentionality Model builds on the child's engagement in a world of persons and objects, the effort that learning language requires, and the essential tension between engagement and effort that propels language acquisition. According to this perspective, children learn language in acts of expression and interpretation; they work at acquiring language; all aspects of a child's development contribute to this process. Lois Bloom (Ph.D., Columbia University, 1968) is an Edward Lee Thorndike Professor Emeritus of Psychology and Education at Teachers College, Columbia University. Her research interests have centered on early language acquisition, in general, and the part played by developments in emotion and cognition, in particular, on language development. Erin Tinker (M.A., New York University, 1990; M.A., Teachers College, Columbia University, 1993) is a Learning Specialist at the Trinity School in New York City. II. The Development of Children with Disabilities and the Adaptation of their Parents: Theoretical Perspectives and Empirical Evidence. III. The Early Intervention Collaborative Study: Study Design and Methodology. IV. Results: Predictors of Functioning and Change in Children's Development and Parent Well-being. VI. Implications for Research, Policy, and Practice. 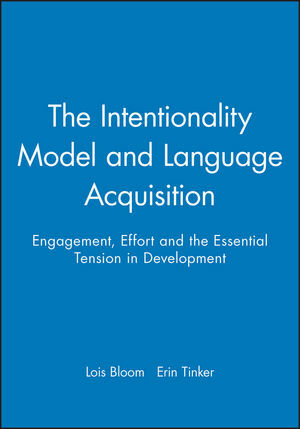 This book provides results of a longitudinal study which examined language acquisition in the second year of life in the context of developments in cognition, affect, and social connectedness. Results of lag sequential analyses are reported to show how different behaviors--words, sentences, emotional expressions, conversational interactions, and construction thematic relations between objects in play--converged, both in the stream of children's actions in everyday events, in real time, an in developmental time between the emergence of words at about 13 months and the transition to simple sentences at about 2 years of age. The conclusions show that performance counts for explaining language acquisition; language is not acquired independently but in relation to other behaviors; acquiring language is not easy and requires the work of behavioral coordination.